Using mist to leap off an enemy and reach a higher ledge would be tough enough on its own in Symphony of the Night, but doing so blindfolded? Let’s leave that to the experts, like amazing Castlevania speedrunner romscout. romscout used a combination of brute memorization, mental intuition, and audio cues to demonstrate how it’s possible to blaze through one of the best Castlevania games on Summer Games Done Quick this week. Though speedrunning is prone to gimmicks, what helps make Summer Games Done Quick compelling is speedrunners taking the time to articulate their process. romscout and the folks joining him for commentary on the couch are fantastic at breaking down exactly what’s happening. 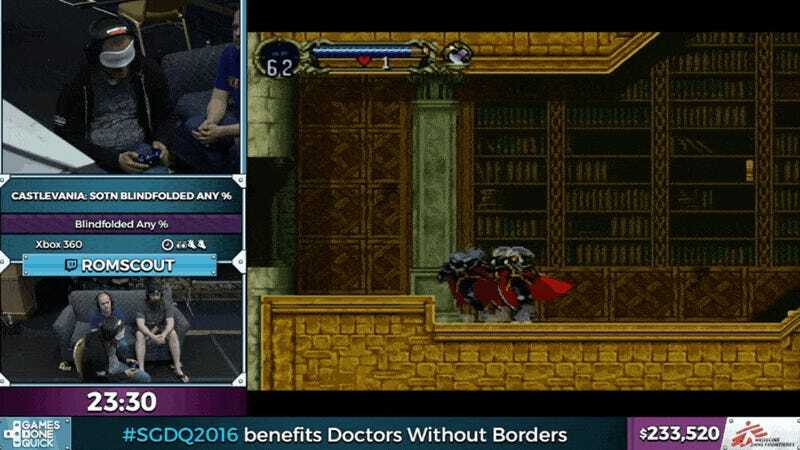 Summer Games Done Quick is still happening right now on Twitch.